Hoax calls to NI Ambulance Service "putting lives at risk"
MORE than 9,300 potential hoax calls were made to the Northern Ireland Ambulance Service (NIAS) over two years, with the cost of dispatching ambulances to deal with these incidents estimated at nearly £200,000. The ambulance service and Department of Health (DoH) have both warned that hoax calls can endanger people’s lives. Statistics, which were released to Detail Data under Freedom of Information (FOI) legislation, show one instance on May 16th 2016 when a crew dispatched from Whiteabbey Ambulance Station spent almost 10 hours dealing with a potential hoax, only to find no case at the scene. The data shows another occasion on December 20th 2015 when five ambulances were dispatched on a call, which was initially believed to relate to either an assault or a sexual assault, and the crews found nobody to treat. There were over 210,000 emergency calls made to the NIAS in 2016/17, almost 10,000 more than were received in 2015/16 and over 20,000 more than in 2014/15. 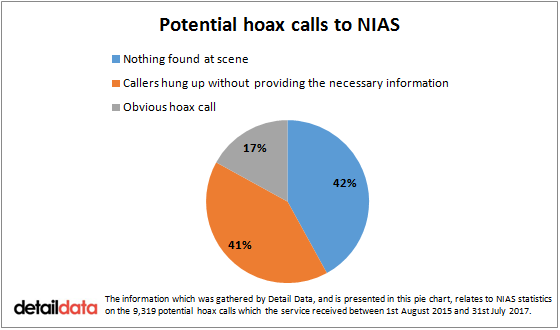 The FOI request sent by Detail Data asked for statistics relating to every hoax call recorded by the NIAS between 1st August 2015 and 31st July 2017. The ambulance service provided details on 9,319 calls which they had categorised as potential hoaxes during this time. The reasons callers gave for needing ambulances included assaults, sexual assaults, overdoses, stabbings and gunshot wounds. Ambulance crews spent over 2,786 hours dealing with these calls. Using cost estimates provided by the ambulance service, we calculated that it cost £195,073 to deal with the potential hoaxes. Ambulance crews spent over two hours each on 79 of the call outs. This included six calls for which they were dispatched for over four hours. On average, there were over six instances per day when ambulances were dispatched to deal with potential hoaxes. There were 4,437 times when ambulances went out on potential hoax calls during this two year period. There were 556 occasions when multiple ambulances were sent out to deal with these cases, 78 instances when three or more ambulances were dispatched and 11 times when four or more were. Just 12 out of the 731 days which we assessed saw no ambulances dispatched to deal with potential hoax calls. “The ambulance service is currently under a lot of pressure,” NIAS Director of Operations, Mr McNeill said. “The demand for the ambulance service has been increasing every year and we don’t have enough ambulances to meet our response times, so therefore, any other additional complications to that, like hoax calls, are tying up the ambulance crews. “The impact is people who really need our services have to wait longer, and in some cases, that could be potentially life threatening. “It also ties up our call takers in the control room. “Every call that we get through the control room, we take seriously, and we put it through a rigorous process to determine what the caller requires. “Hoax callers are no different because we can’t afford to take the risk of someone really needing our help. The NIAS told Detail Data that it costs approximately £70 to dispatch an ambulance for one hour. Using this costing mechanism, we calculated that dispatching ambulances to deal with the 9,319 potential hoaxes during this time was £195,073. Regarding the financial cost, Mr McNeill added: “We could do with £200,000. “We are required to do efficiency savings as every other trust in health and social care, at this point in time, have to make. He continued: “We have, on average peak of day, around 58 to 60 crews operating in Northern Ireland. “In the city of Belfast itself, we have seven crews on a day and seven crews on at night. They are very, very busy. In its response to our Freedom of Information request, the NIAS claimed that it was unable to confirm with 100% certainty that each call was definitely carried out with malicious intent, therefore, it stated that the statistics it provided referred to 9,319 'potential' hoaxes. Regardless of intent, however, all of the money, time and resources spent by NIAS staff in dealing with these incidents were wasted. The response shows the dates when each of the calls took place, the number of ambulances and crews sent on each job, the stations from which they were dispatched, the length of time NIAS employees spent on each job, the reasons why the calls were stopped and the chief complaint given on each call. Out of the 9,319 incidents, 42% of callers either absconded from scenes which they requested ambulances to or ambulance crews found no patient or medical emergency when they arrived. In 41% of the cases callers hung up without providing the required level of information over the phone. The other 17% of cases were categorised as "an obvious hoax call". The information gathered by Detail Data shows four peak days for potential hoax calls, when over 40 were received. They all fell during traditional holidays in Northern Ireland. They were: January 1st 2016 (49 calls), December 27th 2016 (45 calls), November 1st 2015 (41 calls) and July 12th 2016 (41 calls). Mr McNeill commented: “We have kids who have got nothing else to do and think it’s fun and games. “The other thing is I think people are under the influence of alcohol, some are under the influence of other substances. Ciaran McKenna is the Clinical Service Improvement Lead for the NIAS. 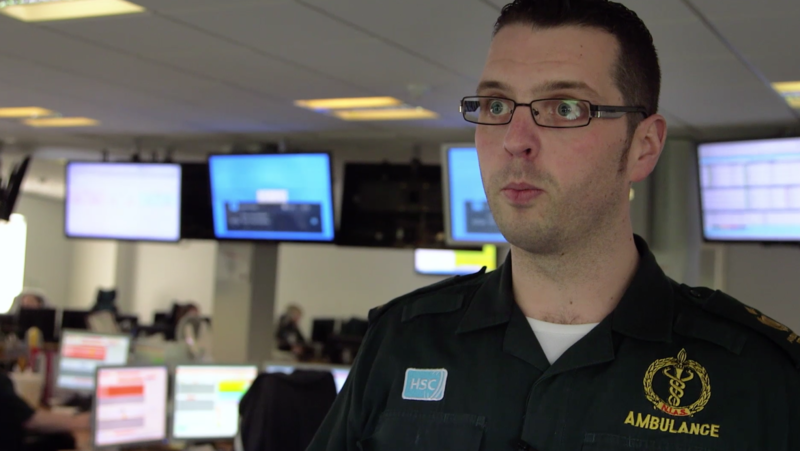 He told Detail Data: “Hoax calls are a massive problem for the ambulance service. “But more than the financial cost, it’s really the issues hoax calls cause, and that we are unable to respond to other calls which does put lives at risk. “It’s becoming more and more of a problem and it’s having a huge impact on our role. Mr McKenna stressed that the judgement of paramedics and medical technicians should be trusted and that patient safety is at the forefront of their minds. “We know there are other genuine calls out there and genuine people who need our help. “Every time we receive a 999 call, we put our blue lights and sirens on, so we are driving at speed, driving through congested areas and are putting ourselves and other members of the public at risk because we are driving under emergency conditions. “It is immensely frustrating when we turn up and we find that there’s nobody there or that this is a hoax call. “We have to be 100% sure it’s a hoax call, so generally that means we are on scene for a period of time, we want to check the origin of the caller, we want to ring back the person who made the 999 call. If it’s an address we want to knock the door, check neighbours. The NIAS control room operates 24 hours a day, seven days a week, all year round. At any one time there are, at most, ten people answering emergency calls for the whole of Northern Ireland. Mr McNeill stated that control room staff play a critical role as the first point of contact for any caller and that their jobs are already tough enough without these calls. Detail Data was allowed access to the NIAS control room to see firsthand how it functions. One of the call takers, Alison Mohammed, told us: “When you’re taking calls you have to spend time to ascertain if it is a hoax or not, so that causes a build up of the other emergency calls trying to get through. “Nine times out of ten, you don’t know it’s a hoax call at the start, until either they hang up on you or the crew go out and there is nobody there. In one instance, she dealt with a man who claimed his friend had collapsed and was unconscious. He was given instructions on how to maintain his friend’s airway, however, about 20 minutes into the call, the man started speaking in a sexually explicit manner, highlighting that this was a hoax call. The police were later informed and the individual is now facing criminal proceedings. Mr McKenna provided two examples of hoax calls which stand out in his career. He said: “We had a hoax call for a multiple road traffic collision that had four ambulances responding, a number of fire appliances and the police, and we all arrived on scene to find that it was a hoax. Kate Clifford, the Director of the Rural Community Network, said she was surprised by the number of these calls. “We know ambulance response times in rural areas will be slower due to the distances ambulances have to travel and the slower speeds required on rural roads," she said. ”Hoax calls have the potential to put lives at risk in rural communities where one ambulance may be at a genuine emergency and the other ambulance is responding to a hoax, at the same time, leaving no ambulance cover in that area. “We know that the ambulance service, like other parts of the health service, has been starved of investment at a time when demand is rising and, as a result, targets for ambulance response times have been missed in recent years. We asked the Department of Health what preventative measures are in place to inhibit the level of hoax calls received by the NIAS. The NIAS also operates a separate Community Education Programme which aims to inform the public of the difficulties caused by hoax calls. Mr McNeill noted, however: "It is very limited. We could do with more money to resource that better." On the issue of funding for the service more generally, he added: "It would be a very useful thing." The DoH spokesperson acknowledged: “Northern Ireland Ambulance Service personnel do a tremendously professional job, often in challenging circumstances, delivering emergency care to those most in need of their services, saving many lives in the process. “Unfortunately their efforts are hampered by the many potentially hoax calls they receive each year. 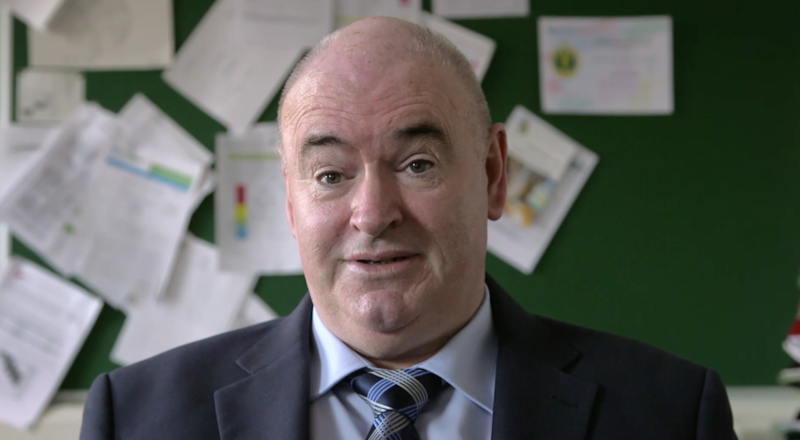 In a message to hoax callers, Mr McNeill pleaded: “I would ask them to stop and to think very seriously about what it is that they are doing and the impact that it’s having on other people who are in need and the staff in the ambulance service. Click here to see the data for this article. In 2012 The Detail reported on ambulance response times across Northern Ireland.